This is our review of IPVanish VPN, based on our real tests from China. Besides this IPVanish review, we have also reviewed a number of other VPN services. If you are looking for a reliable VPN services to be used in China, please also read our list of Best VPNs for China. If you are interested in using VPN outside of China, you can take a look at this IPVanish review or read this List of Best VPNs. Large VPN network with many world-wide server locations. No live chat for customer support. IPVanish is one of the very popular VPN providers with world-wide customers. They have VPN servers in many locations around the world and they support all major VPN protocols. IPVanish’s main website, ipvanish.com is currently blocked in China. If you want to sign up from China, you might have to first use another VPN service to visit their website, or you can sign up from a country where it’s not blocked. However, once you’ve signed up and downloaded their VPN client, you can use IPVanish’s service from China without further problems. IPVanish claims to be the “only true tier-1 VPN service in the world”. It owns one of the largest VPN networks that spans 25,000+ IPs on 225+ servers in 60+ countries, including U.S., UK, Hong Kong, Japan and many more. IPVanish supports the following connection protocols: PPTP, L2TP and OpenVPN. 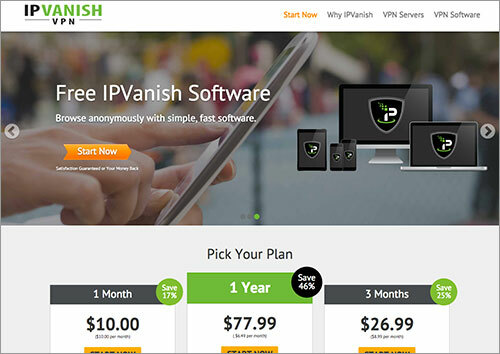 IPVanish provides free VPN software for Windows, Mac, IOS and Android. It also provides instructions on manual VPN set up. The price for IPVanish starts from $6.49/mo (if you pay annually). It doesn’t offer any free trial, but instead offers a 7-day money-back guarantee for users to try out their VPN service. For simultaneous connections, IPVanish allows users to connect to up to 2 devices at the same time. IPVanish provides free VPN software for many platforms, including Windows, Mac, IOS and Android etc. We downloaded their desktop client for Mac OS. The installation process was straight-forward and the software interface is clean. When the IPVanish VPN client software is running, an icon will stay on the menu bar (or called system tray on Windows), and it will indicate whether you are currently connected or not. Then we used IPVanish’s Mac desktop VPN client to connect to their Japan server using the L2TP protocol. We got a download speed of 22.68Mb/s, which was a very fast speed. IPVanish doesn’t offer live chat for customer support. Instead, support requests need to submitted via email. There’s also a support forum for registered users. IPVanish is one of the big VPN providers, with a large number of servers across a large number of countries. It claims to be the “only true tier-1 VPN service in the world”. However, it’s a pity that their main website is blocked in China, making it difficult to sign up for their service from China. You can use another VPN to visit their site to sign up, or sign up IPVanish from outside of China. Once you’ve signed up, installed their VPN software and made the initial connection, you can use it in China without having to use another VPN. If you want to have a second VPN services as a backup, IPVanish might be a good choice. If you are looking for a reliable VPN services to be used in China, Please make sure to read our list of Best VPNs for China. If you are interested in using VPN outside of China, you can take a look at the List of Best Global VPNs. This entry was posted in VPN Reviews and tagged ipvanish, review. Bookmark the permalink.